JUBIZOL installation elements | JUB d.o.o. It is used for precise and simple installation of insulation boards in straight lines. For precise installation of vertical facade plane. Due to its drip-off edge, it prevents the possibility that water rills down along the plinth. It enables precise implementation of a drip-off edge as well as reinforcement of the facade edge in transition from the facade surface to the facade plinth. Widths: 40, 50, 60, 80, 100, 120, 140, 160, 180, 200 mm. Alkaline resistant, vinyl-covered glass mesh, which complies with the ETAG 004 requirements. Double reinforcement is done in case of greater temperature or mechanical loadings, and a single reinforcement with overlaps in normal conditions. Size of mesh spaces: 4-5mm x 4-5mm. Surface weight: 150 g/m2 ina a roll of 50 m2; 165 g/m2 in a roll of 50 m2. It is used on the entire facade surface. PVC corner bead for reinforcement of 90˚ angles (interior and exterior angles). It enables fabrication of level edges of reveal surfaces and outer edges. It is used to prevent damages on outer facade edges. Corner bead length: 2,5 m.
uporabljamo ga za obdelavo vogalov, ki so večji ali manjši od 90°. Used for fabrication of joints between windows and doors with facade. It enables sealing of facade on the area of window and door frames. It prevents the possibility of soaking on joints. It follows facade elongations and prevents joints from cracking due to its elastic gasket. It enables precise implementation of a joint, flat finishing lines, and the possibility of temporary binding of a protective film during facade implementation. Mesh width: 100 mm; profile lenght: 2,5 m.
It forms a drip-off edge on the transition from a vertical facade surface to a horizontal one. 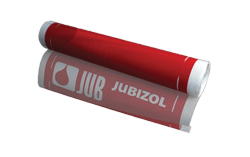 It prevents dripping of water from facade surface to window and door frames.